This chapter describes the Information Systems Architectures for an architecture project, including the development of Data and Application Architectures. Phase C involves some combination of Data and Application Architecture, in either order. Advocates exist for both sequences. For example, Steven Spewak's Enterprise Architecture Planning (EAP) recommends a data-driven approach. On the other hand, major applications systems - such as those for Enterprise Resource Planning (ERP), Customer Relationship Management (CRM), etc. 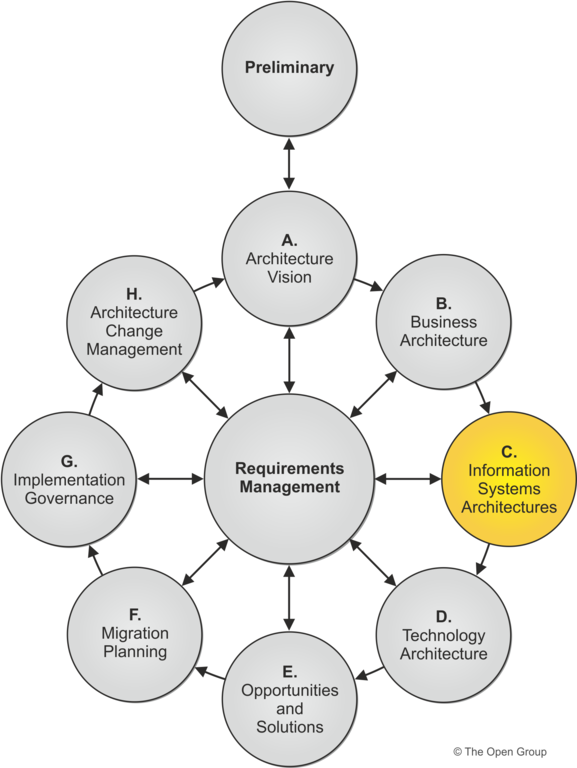 - often provide a combination of technology infrastructure and business application logic, and some organizations take an application-driven approach, whereby they recognize certain key applications as forming the core underpinning of the mission-critical business processes, and take the implementation and integration of those core applications as the primary focus of architecture effort (the integration issues often constituting a major challenge).